It’s a special day around my little corner of the internet! Today is the one year blog birthday for Bake.Eat.Repeat. Which seems a little crazy to me. I honestly can’t even believe that I’ve been doing this blogging thing for a year already. The year has really flown by. Although I’m pretty sure I can attribute that to the fact that I’m getting old and have kids and am now one of those people that incessantly talk about how fast the years are going. Didn’t that always drive you crazy as a kid? When you’d hear grown-ups lamenting how fast time was going and all you could think is that the days were dragging by and school would never end? Well now I understand. Because time really DOES go too fast. Wasn’t I just getting married yesterday with thoughts of children ages away? And now I have a daughter that is nine years old and almost taller than me, and my baby is turning four this week. Crazy. I think part of the reason for the year going so quickly does have to do with this blog though. It most definitely keeps me busy. Busier than I ever expected it to, to be honest. I had no idea what kind of time would go into this when I started. I had a vague idea of snapping a few photos and tossing them up on the internet with a brief little blurb about how awesome the food was. Yeah. That’s not really the extent of it. Who knew? Blogging takes up a ridiculous amount of time. I had no idea. But I also had no idea how much I would enjoy it. When I started this blog a year ago, after a LOT of urging on my husband’s part, I wasn’t really sure if it would be for me. Heck, it took me months just to come up with a name and learn enough about blogging to feel confident enough to take the plunge. And that only happened because one night my husband sat down at the computer, bought me a domain, and said go. Otherwise I’d probably still be thinking about it. I didn’t even tell my family and friends about it until I’d been doing it for seven months. SEVEN months. That’s a long time to keep a rather time consuming part of your life a secret! Now I think it was silly not to tell people, but I wanted to make sure that I actually enjoyed doing it, and was planning on continuing, before I told anyone about it. So….all that being said to get to cake. Because what’s a birthday without cake? And I’m pretty proud of this little blog of mine and what I’ve managed to build it into over the last year. So we needed some cake to celebrate! And this cake is pretty darn amazing. 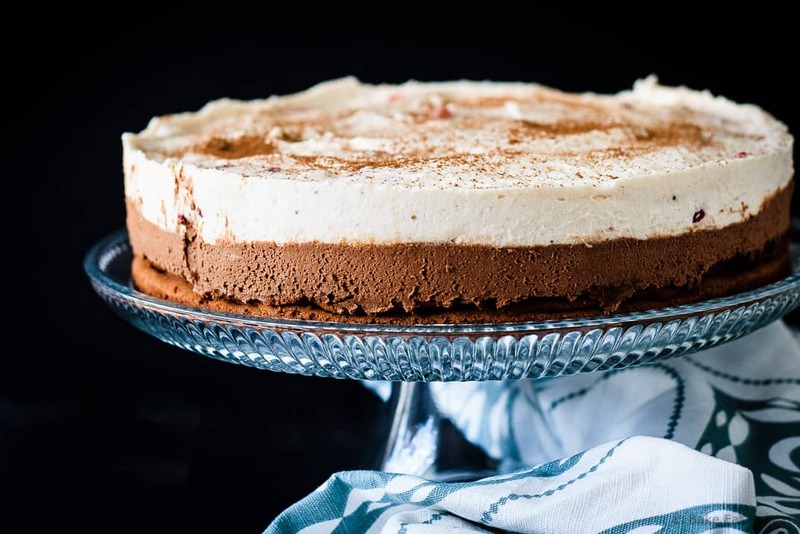 It’s a triple chocolate strawberry mousse cake that is a rich, decadent treat, and a chocolate lover’s dream. 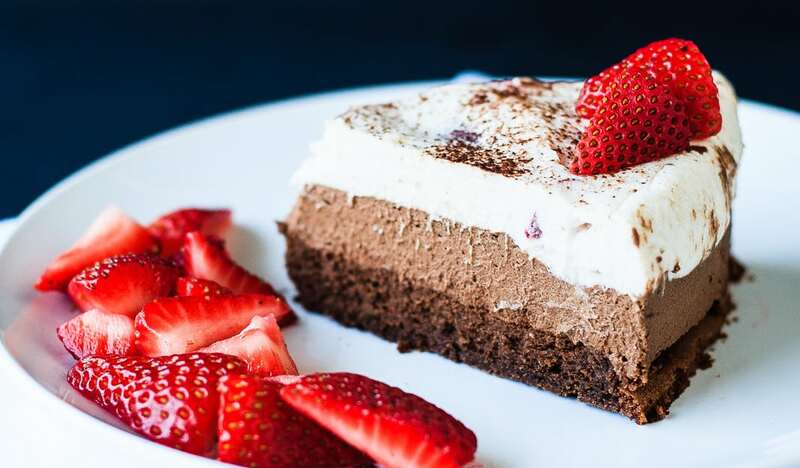 The bottom layer is flourless chocolate cake, the middle is a dark chocolate mousse, and the top layer is white chocolate strawberry mousse. Served with some more fresh strawberries it is absolutely divine. If you wanted to get all fancy you could even top it with a chocolate ganache, which was actually my initial thought, but I ran out of time the day I made this! And it certainly wasn’t lacking in the chocolate department without it! This blog takes up a lot of time, and makes my days go even faster than they otherwise would, but I’m so happy that my husband convinced me to start it. I love so many things about this hobby – from the food, and the photography, to the pleasant surprise of actually making friends through it. Of course, there’s also the social media, which continues to baffle me, but whatever, I’ll figure it out one day! Plus there’s all of you, that come here and read what I have to write, and leave me amazing comments every day that make me smile. So thank you for reading, and commenting, and making this blog what it is. Let’s have some cake and celebrate! Note: This cake is quite soft, so be careful slicing and serving it! If you would like the strawberry mousse layer to be pink in colour you can add a few drops of food colouring to the white chocolate mixture when you are melting it, I didn’t bother. 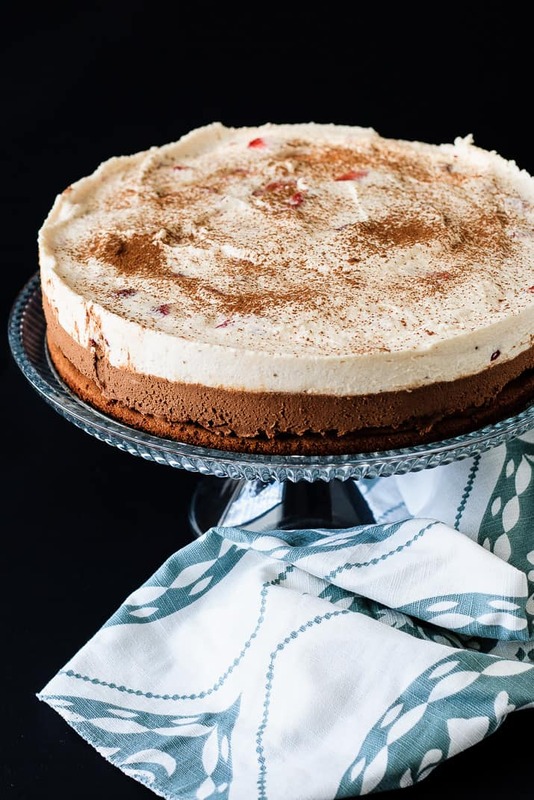 Also, it would look lovely garnishing it with some more chocolate curls on top of a pile of strawberries in the middle - I just ran out of chocolate (and time!). Preheat the oven to 325 degrees F. Lightly grease a 9 1/2 inch springform pan. In a microwave safe bowl (or in a double boiler) combine the butter, chocolate and instant coffee powder and heat at 50% power for 2-3 minutes, stirring every 30 seconds until melted and smooth. Let cool slightly, about 5 minutes, and then whisk in the egg yolks and vanilla and set aside. With a stand mixer and the whisk attachment, or an electric mixer, whip the egg whites, cream of tartar, and salt until foamy, about 1 minute. Add half the sugar and whip until combined, then add the rest of the sugar and continue to whip until soft peaks form. Fold half the egg white mixture into the chocolate mixture by hand with a rubber spatula, then fold in the other half, stirring lightly until no white streaks remain. Transfer the batter to the springform pan and smooth the top. Bake until the center of the cake is just set but is still soft (it will spring back if pressed lightly with a fingertip), 15-18 minutes. Place the cake pan on a wire rack to cool for about 1 hour, the cake will collapse as it cools. For the chocolate mousse layer, mix the hot water and cocoa powder together in a small bowl and set aside. Heat the chocolate in a microwave safe bowl at 50% power for 2-3 minutes, stirring every 30 seconds, until just melted. Let it cool slightly, 2-3 minutes. Using a stand mixer with the whisk attachment, or an electric mixer, whip the heavy cream, sugar and salt until stiff peaks form, 2-3 minutes. Whisk the cocoa mixture into the melted chocolate until it’s smooth and well combined. Fold half of the chocolate mixture into the whipped cream by hand to lighten it, then fold in the other half until no white streaks remain. Spoon the mousse into the springform pan onto the cooled cake, smoothing it out evenly over top. Refrigerate for at least 15 minutes. For the strawberry mousse layer, whisk the gelatin and water together in a small bowl and set aside for 2-3 minutes. Blend 1/2 cup of the fresh strawberries into a puree with a blender or food processor. In a microwave safe bowl, combine the white chocolate, strawberry puree, 1/2 cup of the heavy cream and the salt. Heat at 50% power for 2-3 minutes, stirring every 30 seconds, until the chocolate is melted and smooth. Let it cool to room temperature, 4-5 minutes. When the chocolate is cooled, melt the bowl of gelatin in the microwave, about 10-15 seconds, and whisk it into the melted chocolate mixture. With a stand mixer and the whisk attachment, or an electric mixer, whisk the remaining 1 cup of cold heavy cream to stiff peaks. Fold half of the whipped cream into the chocolate/strawberry mixture until incorporated, then fold in the remaining whipped cream. Gently fold in the remaining 1 cup chopped strawberries. Spread this mousse layer over top of the chilled dark chocolate layer and smooth the top. Chill for at least 2 1/2 hours until set. 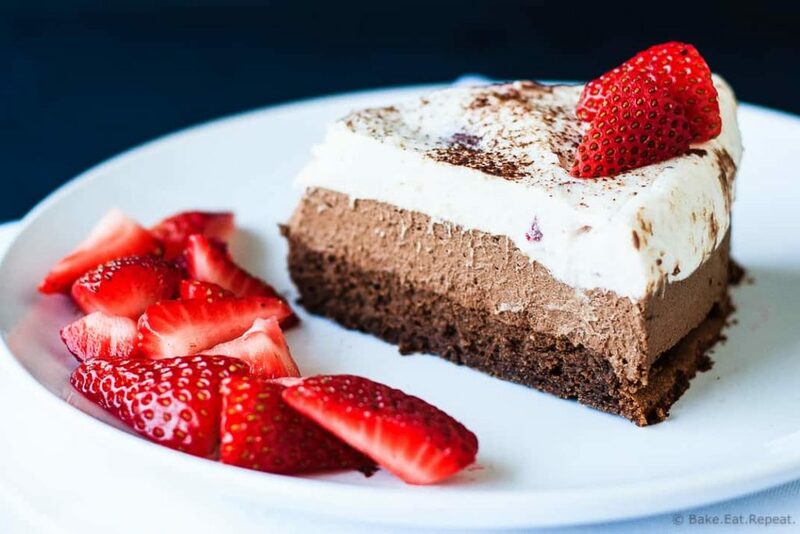 Garnish the top of the cake with a dusting of cocoa powder, shaved chocolate, and/or more fresh sliced strawberries. Run a thin knife around the edges of the cake before removing the sides of the pan. Slice carefully, cleaning the knife between cuts to make it easier, and serve. Source: Adapted from Cook’s Illustrated Baking Book . You've done great, Stacey! I think you picked a great cake to celebrate. I also didn't tell anyone for a while, and I had no idea how much work it would take. But it does have a way of getting to be a labor of love! Well happy blog-birthday! This dessert looks scrumptious! Stacey - Congratulations and Happy Anniversary! I love that you had such a push from your husband to start creating and exploring the world of blogging. Your recipes always look so delicious. :) Keep up the good work. Thanks so much Erin - that's so nice of you! Congrats Stacey!! Looking forward to more exciting recipes from you in the 2nd year! The cake look amazing, perfect way to celebrate! It's tough to actually make that move to start it hey?! Sometimes you need that push! Thanks Kearin! I have to make this sometime this summer, it looks SO good! Happy blog anniversary! Happy blog birthday! So exciting! I am loving this luscious strawberry chocolate treat -- pinned! Thanks Ashley! You can't go wrong with chocolate! Yay, happy blog birthday! Congrats on 1 year! This cake is gorgeous and the perfect way to celebrate! Pinning! Happy one year! This sure is a cake to celebrate :) Looks awesome, pinning! Happy 1 year! This is the perfect cake to celebrate with! I could definitely go for a slice. Congrats!! Time does fly, but like you said, the food blog is a fun project and keeps your family happy :) This cake looks amazing! It is definitely fun! Thanks Kacey! Wow, Stacey! This cake gorgeous! Perfect for your blogiversary. Pinning! Happy Blogiversary!! One year is a huge achievement. It's like making it through the first year of a baby's life. Here's to many more! And this cake. Gorgeous, pinned! I think I got a little more sleep in the last year than I did with any of the babies though! :) Thanks so much Dorothy! Happy bloggiversary, Stacey! That's so exciting! And this cake looks like the perfect treat to celebrate with! It's absolutely gorgeous! I love the strawberry and mousse combo. Just what I need on this Monday morning!